Amongst other things, the credit crunch is also triggering currency fluctuations in the Pund Sterling and the US Dollar. As people may already know, the euro is getting stronger and stronger vs the Pound. That is good news for those of us who buy books as book prices are often just euro equivalent of the sterling price. And sometimes a bit less. 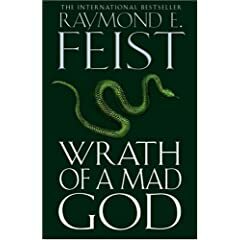 So I was able to buy Wrath of a Mad God on Saturday in O’Mahonys for €20.99 which is a bit less than the exchange rate would suggest. €20.99 is £16.47 at current rates, and the recommended retail price for the book is £18.99. So not too shabby. UPDATE to correct figures from €22.99/£17.93 to €20.99/£16.47 for even cheaper books. This entry was posted on Tuesday, March 25th, 2008 at 8:39 am	and is filed under Uncategorized. You can follow any responses to this entry through the RSS 2.0 feed. You can leave a response, or trackback from your own site.